PageRank (PR) was Google’s original secret weapon, a scale that would rank websites based on incoming links and where those links came from. Although its relevance has arguably faded a bit over the years as Google has added more and more criteria to site rankings, it still goes hand in hand with SEO and every webmaster out there wants to have a high PR. But do you need a high PR to have a successful site? Search rankings are one thing, but what about actual site popularity and traffic? To answer that question, we decided to find out the PR of the top 100 sites in the US. Here is what we found out. These are some of the observations we made. The average PR among the top 100 sites is 7.5. Only two of the top 100 sites have PR 10: Google.com (position 1) and CNN.com (position 18). The top 10 sites are all PR 8 or higher. The first PR 7 site (Craigslist) shows up at position 11. More than half of the sites are PR 8 or 9. One third of the sites are PR 6 or 7. Roughly 10% had PR 4 or 5 (all of them turned out to be adult websites). 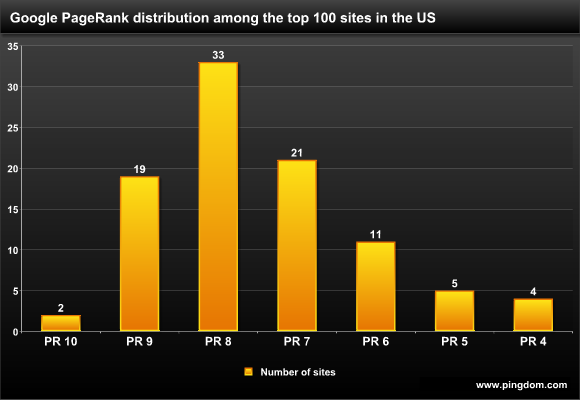 Charting how PR is distributed across the top 100 sites, this is what you get. As you can see, the largest single grouping is the one made up of PR 8 sites, which has as many sites as PR 6 and 7 put together. Above: You may notice that the number of sites only add up to 95. That’s because five of the results in Alexa’s top 100 for the US were not actual websites, but things like ad servers and file servers, so we removed those. For those of you who like to dig in deeper, there is a link to an Excel file with the raw data at the bottom of this article. We have already shown that many of the top websites have a PR of 6 or 7, so it’s clearly possible to have a highly popular website without having a top PR. But what about those websites that do have a top PR? And there are indeed very few sites with PR 10. You can almost count them on your fingers. These are sites (pages) that have been top ranked by Google’s PR algorithm, PR 10 is as high as it goes. How does this translate to traffic/popularity? So just like site popularity doesn’t necessarily translate into a top PR, a top PR doesn’t necessarily translate into site popularity. This makes sense, since ultimately PR is a factor for placement in search results and isn’t directly coupled to traffic. PageRank still matters, it is still one of the many factors used by Google to rank your website, but this study shows that even many of the top sites have a competent but relatively modest PR of 6 or 7 (and some even lower). Conversely, a high PR is in no way a guarantee of success in terms of traffic. This means that unless you want to belong in the top 10 in the world, you should be perfectly happy with a PR of 6 or 7. There is no need to go chasing after some über PR score since you can have a hugely popular website without one. And let’s face it, if you do make that super-successful website, your PR is likely to go up because of that, not the other way around. Tools used: US top 100 sites from Alexa. PageRank was retrieved using the SearchStatus Firefox plugin, with a few exceptions where the PR was retrieved at PRchecker.info. This article is spot on – but one explanation for why PageRank isn’t linked to good rankings is how it is distributed around a site. If it is a large site and you let PageRank flow willy-nilly to any and all pages, then you dilute its impact on any one page. If you care about a specific page(s) ranking on a large site, then you need to optimize the flow of PageRank to those pages. Be careful not to let this confuse you, as the definition for a site’s sucess factor in this article is based on Alexa ranking — which in SEO terms is meaningless. Alexa reflects a site’s popularity with visitors and not search engines. The first paragraph which talks about PR as a ranking factor in Google. That may leave the impression that the article relates to PageRank as a factor in the SERPs. Very interesting analysis, But High Page ranks do not really mean higher position on the SERPs. Nice article and analysis. But as you all know PR is not that important to the site like a unique content, PR represents the quality of the website.